Our "lever spring helper" is a perfect solution for those heavy lever handles and doorknobs that cannot be supported by the lock springs alone. This can be added to any flat-surfaced door plate or doorknob rose. This helper takes the place of the L-S2 we normally mount on our door plates. 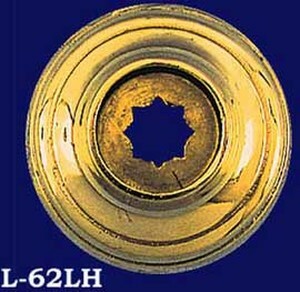 Some door plates cannot be retro-fitted with this helper, since the doorknob receiver is cast directly onto the plate. This is the case with the R&E line and/or plates like L-27. Curved surfaces also have this problem, like the L-15 series. This helper spring works for both right and left hand operations, since it contains a horseshoe coiled spring. Installation: Drill 3 holes and mount with screws from the back. We supply a template so you can do this easily. Please click HERE for an illustrative diagram.